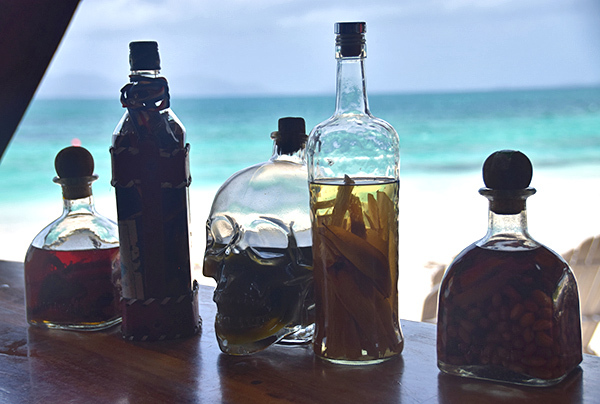 A trip to Anguilla isn't complete without a trip to Bankie Banx's Dune Preserve.The laid-back wooden beach bar sprawls across the beautiful white sand of Rendezvous Bay, a few steps east of CuisinArt. 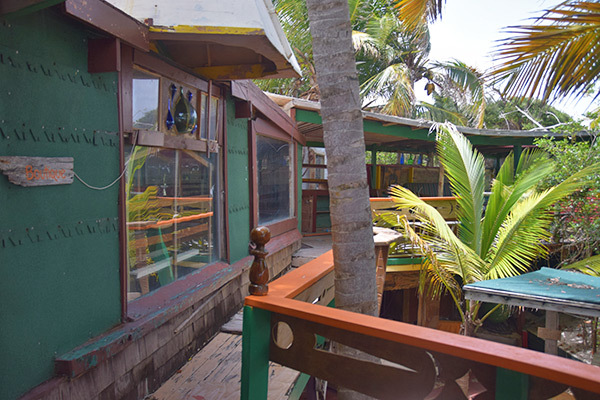 Peppered with fun trinkets and treasures from the Caribbean Sea and all over the world, The Dune Preserve serves terrific food and entertains with exceptional funky reggae tunes. 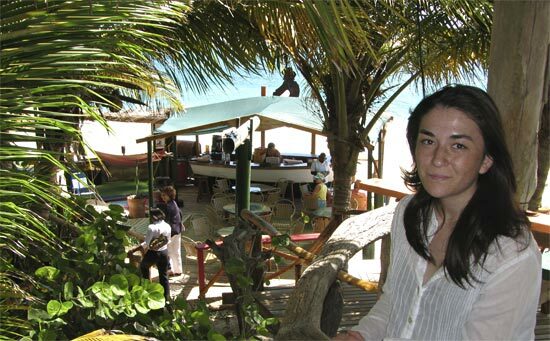 It's no wonder CNN has voted it the #1 beach bar in the world! 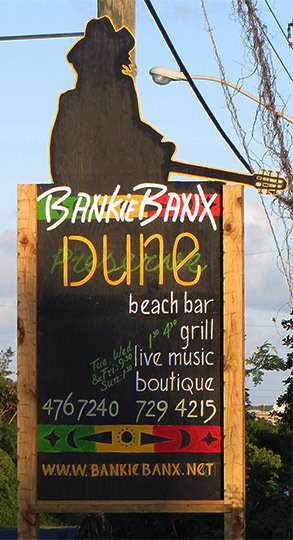 "The Dune" is also home to Bankie Banx's famous Moonsplash festival. 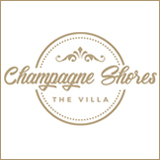 Don't miss their nights of live music. 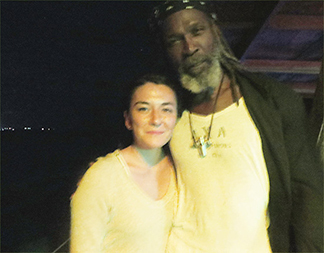 For years people have associated Anguilla's famous reggae artist, Bankie Banx, with his sea-side spot, The Dune Preserve. Like the many pieces of drift wood that adorn the insides of The Dune, Bankie's Bar also appears to have seemingly washed ashore some time in the past century. 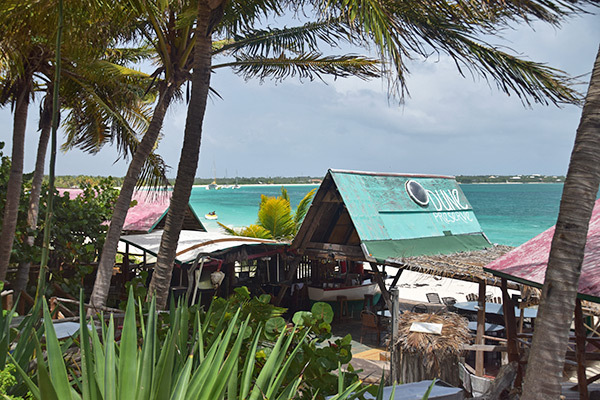 Refitted with hanging boats and loosely constructed with other pieces of wood, this rickety beach bar and its rustic charm is really a staple and a cultural landmark of western Anguilla. 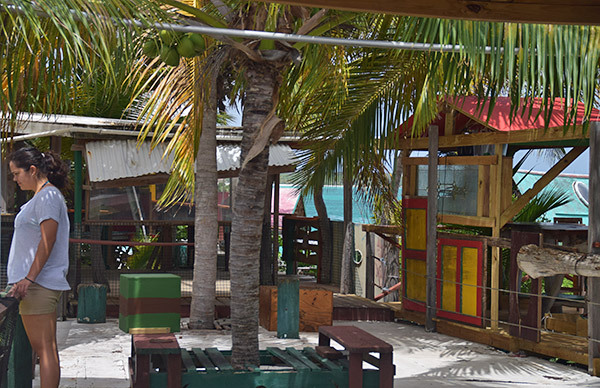 Loved by locals and travellers alike, this quintessential Anguilla beach bar has also been a driving force for Anguilla's musical culture with Bankie's annual music festival, Moonsplash. 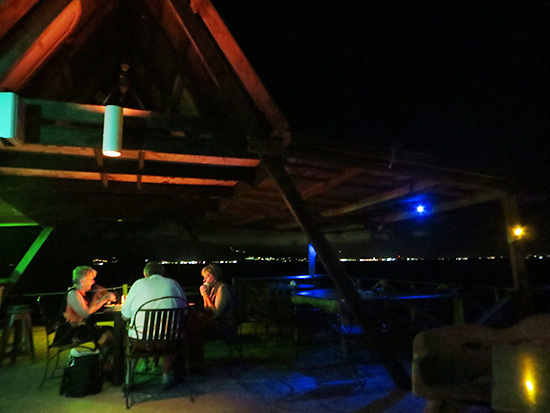 It's even been rated #1 beach bar in the world! It's not hard to see why... there's no place like "The Dune!" 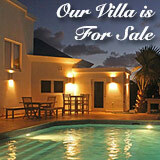 Set at the edge of Rendezvous Bay, overlooking the Caribbean Sea and St. Martin, the location is perfect. 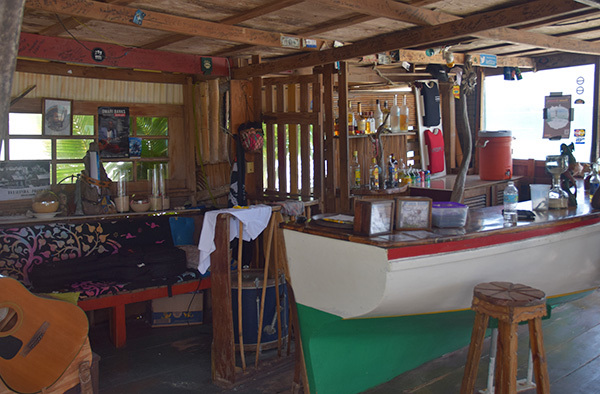 A "boat bar" holds the restaurant together, which is complete with more tables, chairs and lounging areas on a wood-plank floor. 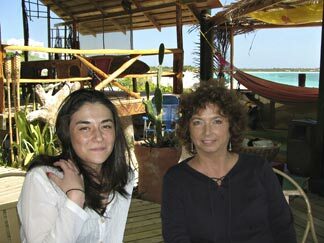 Another bar stretches towards the sea. For larger groups dining, there are secluded perches at either end of wider, extended sections. They maintain that ever-cool Bankie Banx style, and are open-air looking out to the sea. 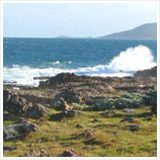 It is a funky-cool natural setting, made of findings from the sea. 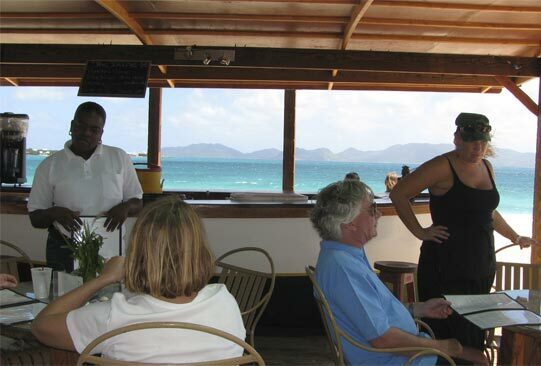 Bankie Banx is a true pioneer and his Dune Preserve is a hallmark when it comes to Anguilla beach bars. Open for lunch, dinner and late night drinks and live music, Bankie's genious creation is the core of many timeless moments shared by locals and travellers alike. 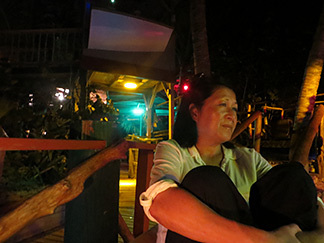 Before dining, be sure to explore every nook and cranny of this sprawling restaurant. 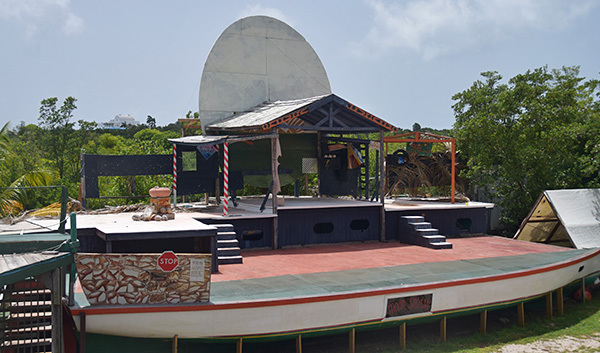 Climb up the historic wooden stairs and walk around the now iconic Moonsplash stage. 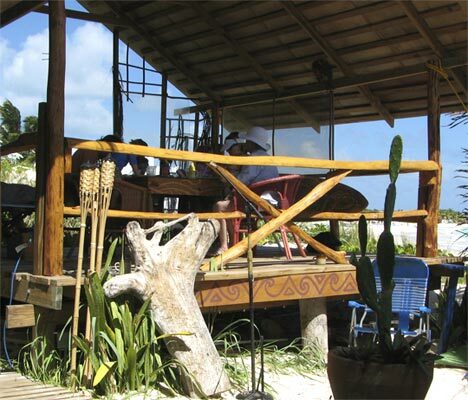 Jump over to the rest of the restaurant, connected by make-shift palm tree roofs and driftwood. 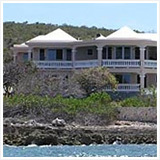 Circle around to the boutique area. Impressive right? 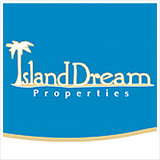 This place is really a one-catch-all... a restaurant, boutique and concert venue. Inside, you will even glimpse portraits of Bankie in his golden years along with photos of the Banks clan. Next? It's off to the bar to chat up the bartender and decide on lunch choices, with a little help from Bankie. It's hard to have a bad time at The Dune. I fondly remember many an excellent meal from "back in the day" in the mid-2000's. One that stood out was when my Dad and I had a delightful lunch at Bankie's spot with our favorite Anguilla real estate agent, Jackie Pascher. I ordered the mahi mahi, Jackie tried a steak sandwich and, upon Jackie's recommendation, my Dad went with the jerk chicken caesar salad. 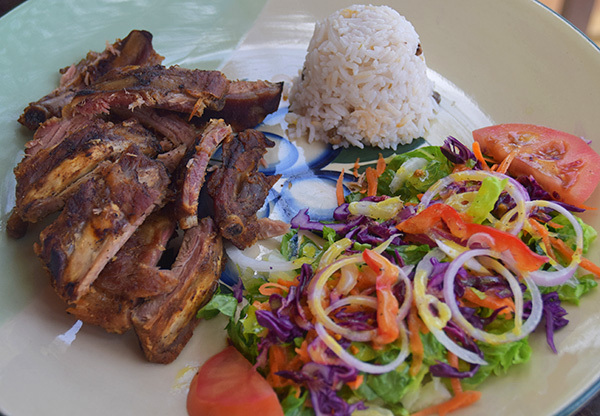 The mahi mahi was cooked to perfection, served with a Caribbean classic, rice and peas. 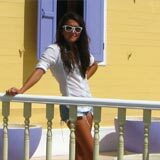 Jackie declared that her steak sandwich was the best on the island! My Dad didn't say much... he was too busy devouring his delectable salad. I only remember him saying, "Thank you for the recommendation Jackie!" To the bar for drinks! 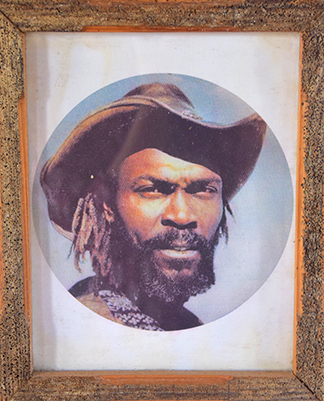 Bankie charmingly boasts his line of homemade rums and with his effortless persuasions, he will convince you to try the peculiar centipede rum. Hesitant at first, it is a quick 1-2 down the hatch and of course with no surprise, Bankie is right... it's really, really good! 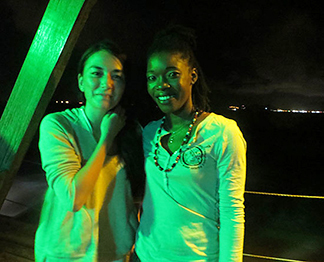 On this particular day, we chose to sit at the very top of the restaurant for its incredible view of Rendezvous and St. Martin. 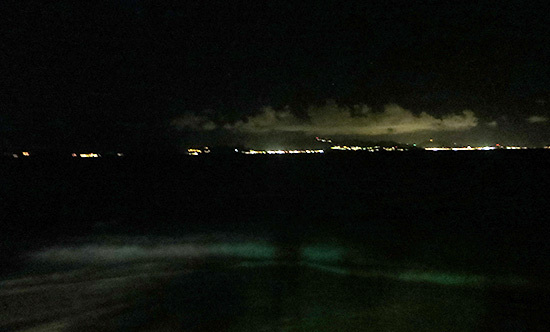 Lofty reggae music played while we exhailed and took in the Caribbean Sea vistas ahead. 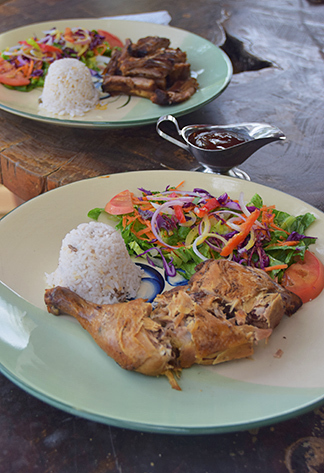 We could smell our food a mile away, making our mouths water before we even saw our meals. When the plates arrived? Speechless! 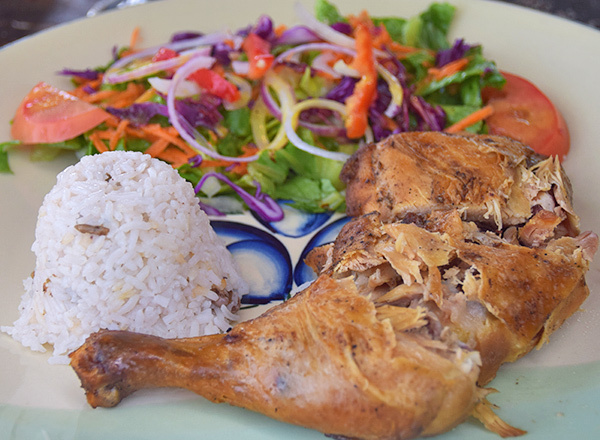 My friend ordered the BBQ chicken that also came with a side of rice and peas and salad. The verdict? Totally satisfied. Bankie knows how to keep it simple and delectable! After lunch? It's back down to spend the rest of the afternoon with Bankie and his crew, listening to great music, jumping into the waves and taking in the easy-cool vibe that categorically defines The Dune. 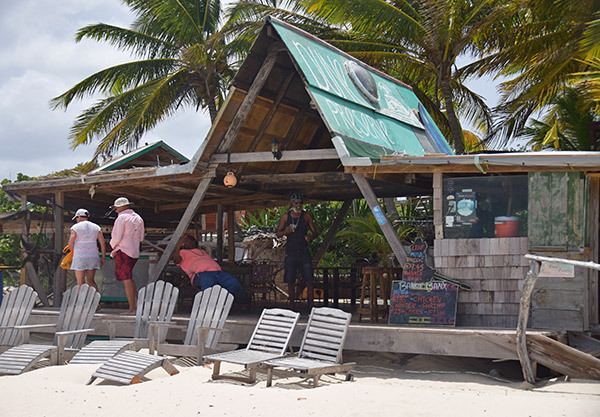 Anguilla BBQ, a one of a kind beach bar that has that funky Bankie Banx feel, sitting upon the golden sand, with friendly service... Bankie Banx's original, classic Dune Preserve will always be an island favorite! Come night fall, The Dune Preserve is especially magical. 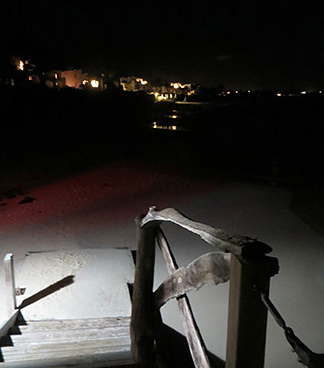 Dimly lit inside, the lights of St. Martin shine in the distance and the stars sparkle overhead. Open to the sky (not all parts of The Dune are covered and sheltered), the moon illuminates it all, at times casting an eerie light on the fast-moving, billowing clouds. And, just beyond the edge of the Dune Preserve, waves lap at the sand. 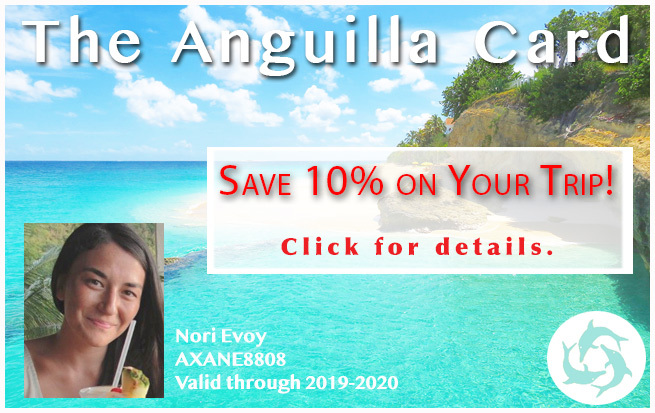 Bankie's ever-cool setting is enhanced by talented artists who take the stage regularly (click here for most up to date schedule of Anguilla events). 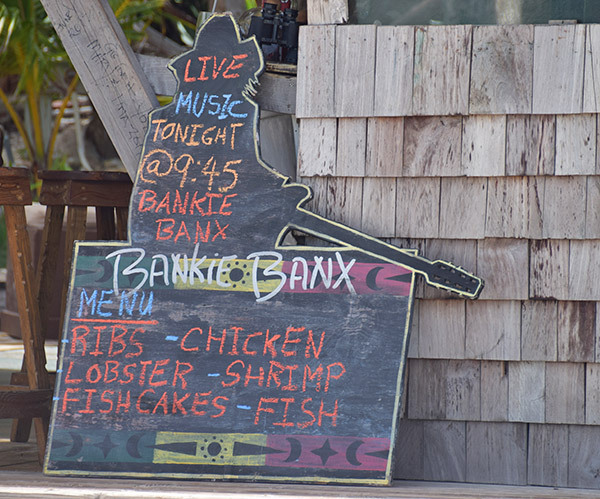 Bankie Banx himself performs on Wednesday nights (starting at 9:45pm). Bankie Banx's son, Omari Banks is known to take to the stage, too. Talented and with a high profile region-wide, he always draws a crowd! The Dune occasionally holds nights that are, by contrast, more low-key. 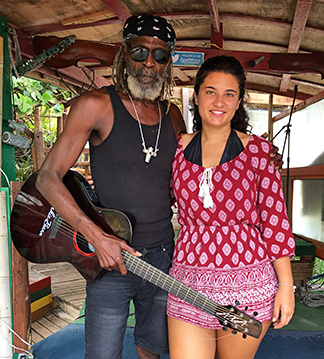 Unlike anything you've likely experienced in Anguilla, they can be closer to something you may have experienced back in the 50's in a cool cafe in The Village in New York City, or only read about in a Jack Kerouac novel. Add poetry, piano, and even table-side service for drinks and dinner and you have a recipe for an interesting evening of introspection and reflection. 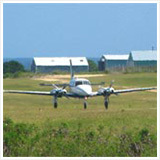 There's nothing else quite like it in Anguilla when they pop up. Brilliant moments of improvisation complete the experience. Bankie Banx himself was hanging around The Dune on the night we visited, talking with guests and taking in the entertainment. The whole audience, naturally, smiled when he got up on stage. From time to time, Bankie will perform some spoken word as well, now and then with Asher Brooks' piano accenting his words. This night, he played a harmonica solo, a cover of Waiting In Vain, and, what was especially exciting for my Mom, an impromptu performance of her favorite song of his, "Just Cool." Totally unexpected, we were delighted. We caught up with Bankie at the end of the night and thanked him for such a unique evening. "This is what I like, this is the music I like," he said cooly. It's the music, setting and overall vibe that I like, too. There's something about it, about the music of such emotion played under a light night sky and beside the dark ocean, that stays with you long after the evening fades. 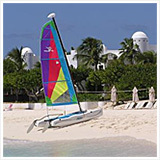 Directions: Head towards the "old" entrance to CuisinArt Golf Resort & Spa (ie. don't enter through the golf course) that is across the street from Hughes Medical Center. 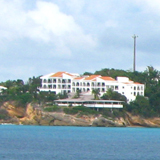 When you reach CuisinArt, keep going straight and then hang a left. You will see Bankie's down by the sea. 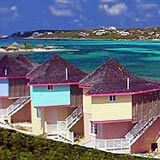 Good for a relaxed afternoon of drinks, reggae tunes, beach and views of St. Martin. Hours: Daily for drinks. Sunday afternoon for lunch. Closed Monday. 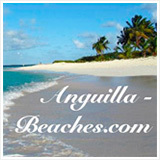 See Anguilla Events for live music schedule.